Well, I brainstormed like crazy trying to come up with activities to make my kids' summer fun and memorable, and then I thought What about us Mamas? 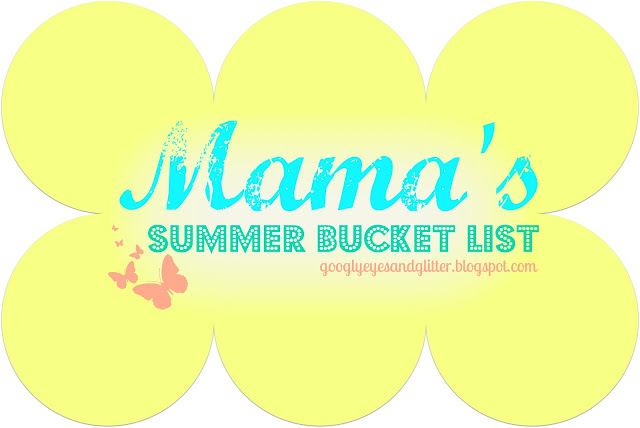 and so I decided to make a bucket list for us too (noticeably shorter! I'll actually be crazy impressed if any of us accomplished half during the craziness of summer). I know you're super crazy busy being a rockstar mama, but try and find some fun time for yourself to, you deserve it!! Enjoy!! As a reward for completing the previous item, go shopping and buy everyone 1 new fun item for Summer! Pick something from pinterest you've been dying to try and DO it!! I want to make these crock pot lotion bars! Pick one bad habit and kick it to the curb! Glitter something you bought at a thrift store/yard sale. check! Make & Freeze Pesto Ice Cubes from fresh basil *last year when I tried this they lasted a week because it was so yummy!